Mother’s Day is right around the corner and its time to think about a gift to give to all those special women in our lives. A homemade gift is always so special to enjoy. 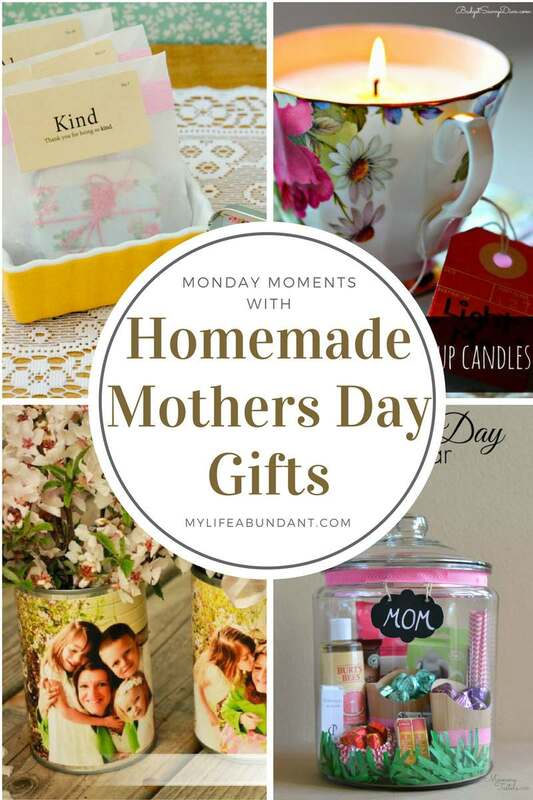 Here are a few quick and easy gift ideas for you to make to give to mom. I love lip balm and I don’t know many moms who don’t have some kind of lip balm close by. Here is an easy DIY Lip Balm project by Stampington & Company to make. If you have a mom who loves teacups or collects them, how about this cute idea for a Tea Cup Candle by Budget Savy Diva. Teacups are so easy to find in yard sales and flea markets. This gift idea is so budget friendly by The Krazy Coupon Lady taking cans and family photos and making photo vases with them. The kids would love to make these with you. Hello Splendid has made one of my favorite type of gift to make called a gift in a jar. There are so many different things you can put in any type of jar to make the perfect gift. Think about what your mom loves for starters.